What’s your favorite outfit? Maybe it’s a t-shirt and comfy jeans or your favorite athletic shorts. You probably have lots of choices in your closet for what you’ll wear each day, but it wasn’t always so. The first people made clothes out of animal skins for protection and warmth. These clothes took a long time to make, but they also lasted a long time. People wore them until they wore out and probably didn’t clean them very often. Yuck! 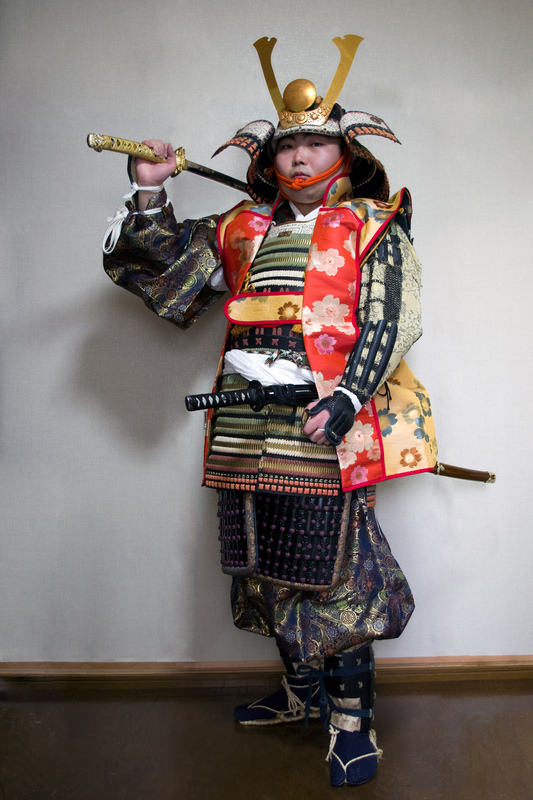 Later, people wore clothing to protect themselves in battle. Medieval knights wore heavy armor and helmets. 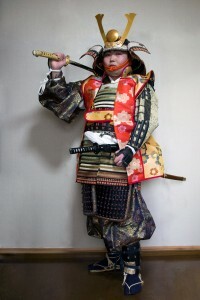 So did Japanese Samurai warriors. Clothing for every day was made from natural fibers, such as cotton, linen, wool and silk. Cotton and linen fabric are made from plants, while silk is made from fibers spun from silkworms! Wool is sheared from – you guessed it – sheep. 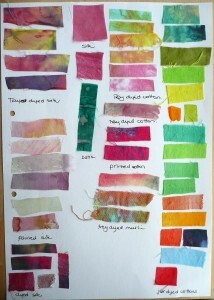 People used dyes from berries and plants to color the fabric. They didn’t have zippers, buttons or Velcro, but instead, used ties. The two main purposes of clothing are warmth and protection, but people also use clothing to show who they are. 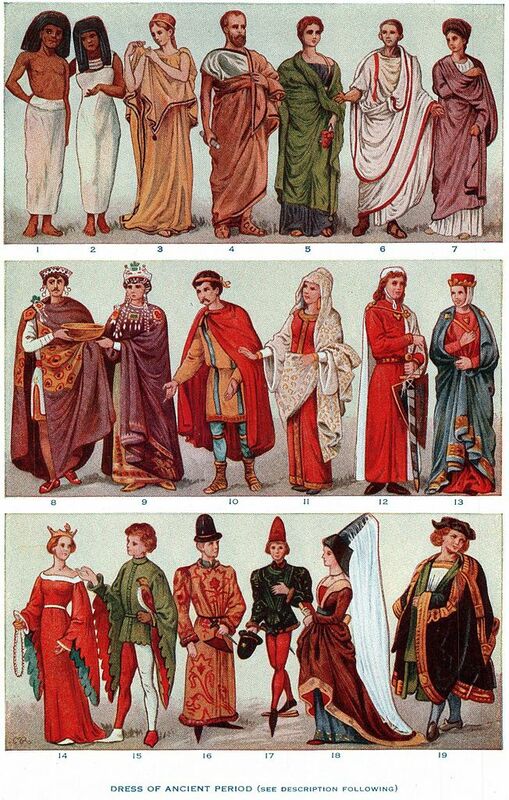 Important, wealthy people wore – and still wear – fancy, brightly colored, costly clothes to show off. People also wore clothing to show which tribe they belonged to. Romans wore togas, while some African tribes wore brightly colored garments. We still do this today. Think of your favorite football team. Do you have a shirt in the team colors? Some clothing suggests a specific type of work, such as the uniforms nurses, firefighters and policemen wear. Chefs wear white or black chef’s shirts. Scientists wear lab coats. Only a few decades ago, most people wore clothing they made at home. Today, most clothes are made cheaply in factories overseas. The people in these factories often work long hours in poor working conditions. In some parts of the world, clothing is very expensive. Scientists have used the study of lice – yes, lice – to create theories about when clothing was first developed. Body lice live in clothing and that species split off from head lice around 100,000 years ago. Protective tubes are created by some invertebrates and those could be thought of as clothes. Polyester is a common material used to make clothing and it is basically a plastic. It isn’t always the clothing protecting the wearer from the environment. Sometimes it protects the environment from the wearer such as doctors wearing surgical scrubs in an operating theater. The laws of Islam require women to dress modestly. In some other cultures it is perfectly acceptable for women to be bare chested in certain public places such as beaches. Sometimes men wear skirts such as togas and kilts. While that is not common in most areas today, historically they were normal day to day wear. Science is always looking to improve upon the materials used to make clothing. One innovation was the creation of Kevlar, a material that can is durable enough to stop bullets. Animal fur and skins were one of the first types of clothing and are still used in arctic climates today for their warmth. Today fur is generally regarded as a luxury item and many people act out against those who have it in protest against this unnecessary and cruel treatment of animals. Cleaning your clothing is very important. It doesn’t only get dirty from the outside, but also from the inside due to sweat, urine, feces and dead skin cells. So we repeat: Cleaning your clothing is very important. A children’s video that teaches all about what do you wear and enhances vocabulary. Question: How big is the business of making clothing? Answer: In a word: Huge. The clothing, or fashion, industry is one of the largest in the United States. Millions of people and billions of dollars are involved in the concept, creation, advertising, distribution and sale of clothing. Question: What is a sweatshop? Answer: A sweatshop is a workplace with very poor and often dangerous conditions where workers are usually working for very long hours for very little pay. Usually these places operate with a total disregard for any labor or safety laws that may exist. Using child labor is common in a lot of areas overseas where poverty is rampant and the children are sent to work to take whatever wage they can get to help support their family. A better situation would see them in school and playing with their friends instead. Enjoyed the Easy Earth Science for Kids Website all about What Do You Wear info? Take the FREE & fun all about What Do You Wear quiz and download FREE all about What Do You Wear worksheet for kids. For lengthy info, click here. Declan, Tobin. " Fun Clothing Facts for Kids ." Easy Science for Kids, Apr 2019. Web. 26 Apr 2019. < https://easyscienceforkids.com/all-about-what-do-you-wear/ >.